Imagine this classic slapstick scene: Two repairmen have to carry a pane of glass across a busy street. Car after car whizzes past and, somehow, swerves around them. The whole scene is about waiting for the glass to break. Egan’s latest Dodsworth book is a lot like that. “We should be on our best behavior here,” Dodsworth tells his duck. He warns the duck not to play ball around priceless vases. He warns the duck not to play with a bottle of ink. “The duck,” the text notes, had always wanted to play with ink.” The duck does not crash into the pottery. 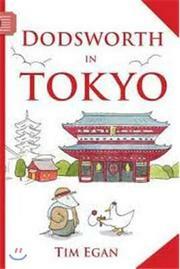 The duck doesn’t spill any ink, and a server in a restaurant tells Dodsworth, “Arigato. Your duck is very well behaved.” As in classic slapstick, though, something has to give. At the climax of the story, the duck swings on a rope, springs off an awning and knocks over a tub of goldfish. It’s worth the wait. When the duck bounces across a row of drums, precisely in time to the music, it’s a very satisfying moment. But the scene really works because of what happens next: The duck walks quietly across the courtyard and hands a toy to a little girl. She had thought it was lost forever. That, too, is worth the wait.